Expect great things when you shop Kohl's for apparel, shoes, accessories, home products and more! Kohl's stores nationwide and Kohls.com help shoppers play and save with style by providing quality brands at a value they can appreciate. Kohl's powerful brand portfolio includes private and exclusive brands at exceptional values such as Simply Vera Vera Wang, Jennifer Lopez, LC Lauren Conrad, Marc Anthony, Food Network, Bobby Flay, ELLE Contemporary Collection, ELLE DECOR, Dana Buchman, Candie's, Mudd, Tony Hawk, Apt. 9, Chaps, Jumping Beans and SONOMA life + style. New this spring, customers can also enjoy the exclusive Rock & Republic collection for men and women. Expect more great things online at Kohls.com, where Kohl's features the same unbeatable values and brands, plus items, styles and sizes you'll find exclusively online! 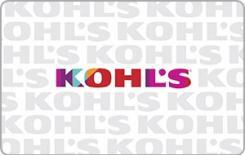 Kohl's Gift Cards are accepted at any of our over 1,100 Kohl's stores nationwide and online at Kohls.com. Kohl's Gift Cards have no service fees and no expiration dates. Check out the new Swagstakes Portal, where you can win tons of different Gift Cards for a fraction of the Reward Store prices!